All the talk of how Bashar al-Assad directs the Islamic State of Iraq and ash-Sham (ISIS), how his men have infiltrated ISIS, how the regime pays ISIS or how it controls or runs ISIS, doesn’t make much sense in terms of the progress of the Syrian Revolution, because — even if it were true — it’s plain implausible to the average interested reader. There’s just no (or not enough) evidence out there to back these claims, and that provides supporters of both Assad and ISIS with far too many weak points to attack such half-baked conspiracy theories. However, a fact that no one can deny is that the way ISIS acts on the ground in Syria makes them looks like they’re just another of Assad’s tools of oppression, alongside the Syrian Arab Army, the National Defense Forces, the “shabiha”, the mukhabarat (security forces) and so on, plus Hezbollah and all the other foreign terrorist organizations fighting on behalf of “al-Batta” (Bashar al Assad). For the suffering Syrian people, there’s no difference between an attack by Hezbollah on Qusayr and an ISIS attack on Al Bab. In both cases the aggressor deploys unbelievable brutality both during the attack and in its aftermath, in the combing operations that kill even more civilians, the looting, and the oppressive regime in the days, weeks, and months afterwards. But does that prove without any reasonable doubt that ISIS is just another Assad regime mercenary like Hezbollah? Both Assad and ISIS launched a war on the Syrian people, because both want the same for themselves — that is as much ground on Syrian soil as possible, populated by enough fearful Syrian slaves to keep the oppressor’s farm business running and prospering. The ideology (Baathism in the case of Assad, versus a weird so-called ‘religion’ partly based on a totally messed-up misunderstanding of medieval Islam in the case of ISIS) is different, of course — but the goals and methods applied are identical. Both the Assad family and ISIS are mafia gangs, both act as such, and both are led by ruthless bosses who don’t give a flying rat’s fart about religion or ideology, which they see as just a tool to please and unite their followers and foot-soldiers, and a cheap way to gain international support from misled private donors and fascist states like Russia or Iran (in case of the latter geopolitics play an important role too, that’s a different but similarly disgusting topic we won’t go into here). So these are the similarities. Simplified, but significant — in fact there’s not much more to add without writing a book on criminal intent. Now let’s take a closer look at arguments that “ISIS is run by Assad” crowd shove down our throats on a daily basis, with an increasing cadence recently in preparation for the useless Geneva II diplomatic circus that doesn’t serve any other purpose than prolonging Assad’s “mandate” to kill and oppress scores of Syrians eternally. Here’s their claim: The Assad regime doesn’t attack ISIS with air strikes, in some cases Assad’s artillery and air force provides battlefield support for ISIS units attacking Syrian insurgents. Well, both observations are true, obviously. However, the conclusions are wrong. In fact the Assad regime does that just because it fits their interests, not because they are protecting their “own forces”. The Assad regime leaves ISIS alone, and sometimes even supports their military operations, because Assad considers ISIS thugs to be helpful for various reasons. For example, in insurgent-controlled areas ISIS establishes a terror regime, replacing Assad’s oppression with their reign, by making use of an even crueller modus operandi. This serves two purposes for the Assad regime. First, ordinary Syrians under the ISIS regime can no longer be bothered with opposition activities, or even regime-unfriendly thoughts any more, because they’re far too busy surviving the indiscriminate ISIS oppression on a daily basis. Second, the brutality of the ISIS regime sets an example that’s even worse than some visible elements of the Assad regime. Under Assad, killings of dissidents happened in secret detention facilities and mukhabarat dungeons, not in the village market place in front of a large audience, including children, who are all forced to attend events like public beheadings. The logic behind this approach is simple. If Assad can no longer rule a town or village, he prefers ISIS terror above troublesome local coordination committees, which establish grass-roots democracy, breeding ideas and making positive experiences that make Syrians even more rebellious against the Assad regime than they were previously. Assad’s calculus is ruthless, but it does work to some extent. 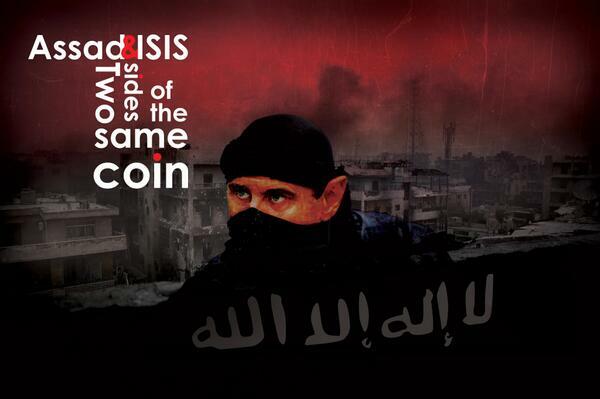 Of course, there is some cooperation between Assad and ISIS on lower levels. For example, where ISIS units more or less openly work hand-in-hand with regime forces for pragmatic reasons, since ISIS is in Syria to establish their terror state, and not to fight Assad in the first place (of course they do that when Assad’s forces get in their way, but that’s rare). Also, in some cases ISIS did join in battles against the regime, to obtain spoils of war and/or territory, not for the freedom and dignity of the Syrian people. Those ISIS units always were small, and came late to the theater, but their tactics made headlines like in the battle for Menagh Air Base last August. For this reason, ISIS’s propaganda machine was able to sell the rebel victories as ISIS-led, partly due to the non-existent PR work of the real Syrian revolutionary forces (one can’t assign ISIS to the rebels, not even as a ‘faction’, they’re aliens to the Syrian people — including the Syrian rebels and the few foreigners fighting in their ranks). The handful of battles ISIS fought against the Assad regime is the sole argument used when Syrian rebels and activists criticize ISIS for their atrocities, brutal oppression of civilians, theft of (Western-supplied) humanitarian aid, attacks on ‘fellow’ rebels, and so on. “We’re your brothers, so many of us died for you, we left everything at home to help you out, so don’t spread fitnah” — these propaganda lies are disgusting to the well-informed observer — they served ISIS well for a long time, as did their brutality that they used to spread fear, and which prevented opposition even in areas where only a few ISIS thugs were stationed. 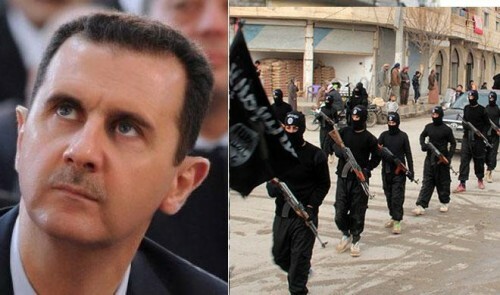 Of course does Assad still fund ISIS, as Al Qa’eda in Iraq/ the Islamic State of Iraq, since 2003, (nowadays through middlemen), but it’s highly unlikely that the central ISIS command level, which are all Iraqis, has been infiltrated. It surely looks to be the case, but just because both make use of the same methods to oppress the same people in Syria, that doesn’t mean they’re working for the same boss. As for ISIS’ activities in Iraq — a close Assad ally — that scenario makes even less sense, although there’s no such thing as loyalty or friendship under thugs like Assad and Maliki. Go figure. That leaves us with the crude oil and gas deals. Yes, ISIS as well as others have deals with the Assad regime. Oil and petroleum gas for US dollars. Initially, all these deals were made between local tribes and the regime. Oil and gas for money, and protection — as in no air raids. When ISIS (or Jabhat al-Nusra) overtook an oil well, they just kept these agreements in place, collected the money, and laughed all the way to the bank. The regime relies on every domestic source of oil and gas, so nothing changed except the production well ownerships. As far as Jabhat al-Nusra, which actively fights the regime and doesn’t bother much with pseudo-Islamic-driven oppression of civilians like ISIS, is concerned, this is not very bad news at the moment, since Jabhat al-Nusra invests all these petrobucks in the revolution. But with ISIS, it’s very bad news indeed, because ISIS not only financed their recent operations in Iraq with these oil sales, but they were also able to build up solid financial reserves which now enable them to hold their ground against Syrian revolutionary forces in Raqqa and Aleppo provinces, and elsewhere. There are more arguments, like the Syrian Islamists released from Syrian prisons in 2011, but they are weak , since the ISIS leadership consists of foreigners, not Syrians. Also the fact that some ISIS thugs had Russian and Iranian visas in their passports proves nothing except the route these guys took to reach Syria. So, the bottom line is that probably Assad prays for the survival of ISIS in Syria every morning, but he does not have them on his payroll. It’s possible that some day, sooner rather than later, evidence of a closer Assad-Baghdadi cooperation will emerge. So what? It won’t make a difference at all, since both the Assad clan as well as al-Baghdadi’s gangs are terrorists who deserve to get rooted out from the surface of this wonderful planet, thug by thug. And the same goes for the fascist regimes (Russia, Iran, Iraq) supporting Assad’s terror reign, foreign terrorist organizations like Hezbollah and the Iraqi militias who fight the Syrian people on Syrian soil, and all those private donors who fund these enemies of Syria, regardless their motives. John Adalah is an observer and supporter of the Syrian Revolution who prefers to remain anonymous.